Text: This leaf contains the text of Livy's History, Book 27, Chapter 22. A scan of the verso is not currently available. The English translation is that of Cyrus Edmonds (1850), via Project Gutenberg. [...] the senate thought proper. Sextus Julius Caesar had Sicily, and Quintus Claudius Flamen, Tarentum. Quintus Fulvius Flaccus was to continue in command for a year, and hold the province of Capua, which had been held by Titus Quinctius, with one legion. Caius Hostilius Tubulus was also continued in command, with orders to go into Etruria, in the capacity of propraetor, and succeed Caius Calpurnius in the command of the two legions there. Lucius Veturius Philo was also continued in command, to hold in the capacity of propraetor the same province of Gaul with the same two legions with which he had held it as praetor. The senate decreed the same with respect to Caius Aurunculeius, who, as praetor, had held the province of Sardinia with two legions, which it did in the case of Lucius Veturius, and the question of the continuation of his command was proposed to the people. He had in addition, for the protection of the province, fifty ships which Publius Scipio had sent from Spain. To Publius Scipio and Marcus Silanus, their present province of Spain and their present armies were assigned. Of the eighty ships which he had with him, some taken from Italy and others captured at Carthage, Scipio was ordered to send fifty to Sardinia, in consequence of a report that great naval preparations were making at Carthage that year; and that the intention of the Carthaginians was to blockade the whole coasts of Italy, Sicily, and Sardinia with two hundred ships. 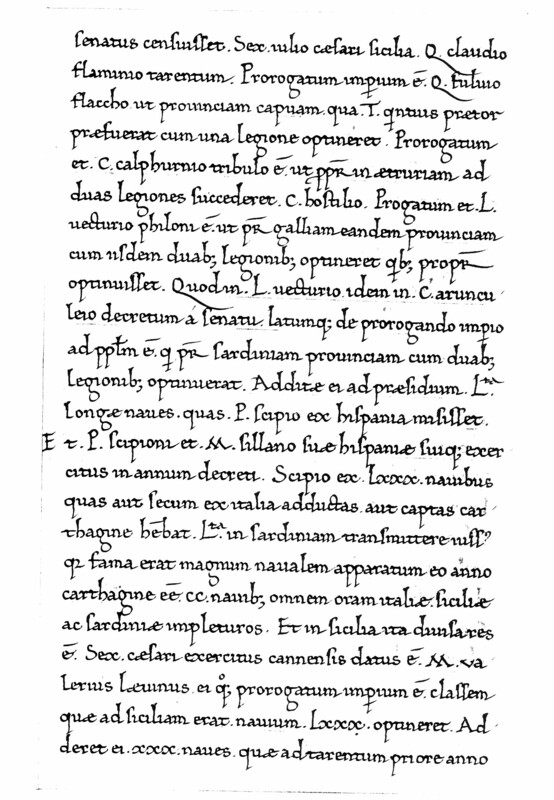 In Sicily also the following distribution was made: to Sextus Caesar the troops of Cannae were assigned; Marcus Valerius Laevinus, who was also continued in command, was to have the fleet of seventy ships which was at Sicily, adding to it the thirty ships which the preceding year were stationed at Tarentum.